802. When is a negative UA sufficient to rule out UTI? 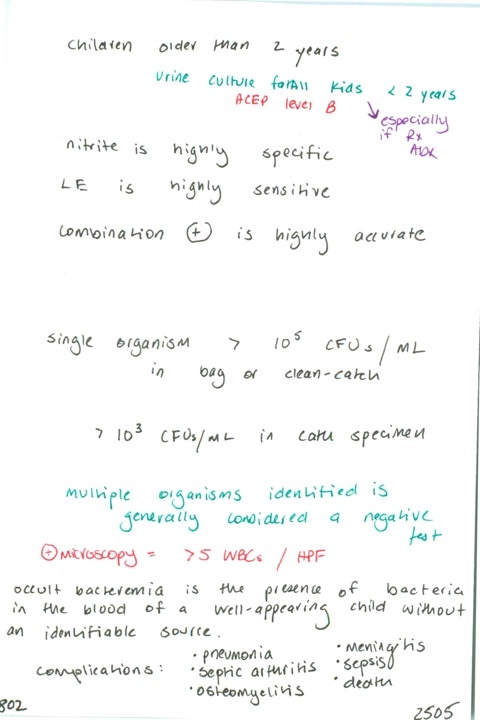 / Value of urine nitrite and leukocyte esterase / Commonly accepted definition of positive urine culture & microscopy / What is occult bacteremia? What are the possible consequences? Next PostNext 803. What % children 3-36 months previously well who have fever without source will have an SBI? / what % will have meningitis or sepsis? / When should antibiotics be considered in well children aged 3-36 months? / Is the likelihood of bacteremia proportional to temperature and WBC count?